蔬菜食谱 - Welcome to GreenPower Juicer! This exciting soup is excellent on it's own or can be transformed by using different seasonings. Place the crush screen component onto the twin gears. Let the seaweed, macadamia nuts and avocados run through the guide together until you get a smooth paste. Mix oil and water into this paste. Sprinkle with chopped chives and sunflower seed sprouts. Seaweed has an intense taste. It's an ideal natural food supplement so start with a small amount if the taste doesn't appeal to you in the beginning. If you like Japanese Sushi you'll probably like this soup as well. Set up your Hippocrates Living Food Processor with the Vegetable Screen in place. At first, close the white pulp discharge knob completely by turning it clockwise. Wind the knob out halfway by turning it counter clockwise after a few drops of juice. Place a bunch of wheatgrass (about 1 inch diameter) tip down into the feeding Chute. Feed carrots and other desired fruits or vegetables into the chute for a milder tasting combination for those who haven't tried pure wheatgrass juice before. Wheatgrass is one of the best blood cleansers. It is high in chlorophyll, a molecule that closely resembles hemoglobin found in the red blood cells. Fennel has an exotic and intense taste. For committed raw food eaters this can come as a welcome change. First place the Vegetable Screen onto the twin gears. At first, wind the White knob completely in by turning clockwise. Wind out the knob about halfway after a few drops of juice have come out. Wash the potato before juicing. Leave the skin on for extra nutrients. Please be aware that fennel has a very strong taste. Start with little and then add more or make this juice without fennel for people who really don't enjoy the taste. Fennel assists you as a mild sedative and in falling asleep. Fennel has been shown to reduce and control inflammation of arthritis. It also evens mood fluctuation and depressive states. Fennel has the rare nutrient called manganese, contains zinc and vitamin B complex, which makes it a very valuable choice for juicing. Tomatoes have also been called 'Love-apples'. Love is good to be felt every day which is why this is the Soup of the Day. Love every day as if it was your last day to express all the gratitude and all the celebration to creation around you. Cut the carrots and the tomatoes into slices. Mix all ingredients in a bowl together. Then let everything run through the Hippocrates together. Decorate the soup with the lemon flowers. Tomatoes are more difficult to juice because of their liquid consistency. Let one spoonful of the mixture drop into the chute at a time. If the pulp turns still out fairly moist juice it again one more time. You can mix some of the pulp back into the soup for a high fiber boost. Red, the colour of the heart also inspires appetite. This juice shoots delicious arrows to the heart of your taste buds. Red capsicum creates a wonderful taste sensation and for extra spice, try a touch of chili. You can prepare this juice as an appetizer for a dinner party several hours before you serve it. Serve the juice in tall glasses and decorate the rim of the glass with a fresh chili husk by slicing it open in the middle with a knife. Add an ice cube into each glass just before serving and sprinkle with black pepper. You can grind peppercorns yourself in your Living Food Processor. It's going to get the party going! 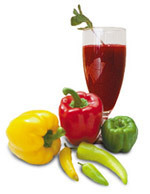 Red capsicum is rich in vitamin A, C, potassium and silicon. It reduces risk of cardiovascular diseases by assisting in the prevention of blood clot formations. Chili is a stimulant for the whole system and is said to increase passion. This juice is a little meal in itself and is a deeply satisfying drinking. Garden tomatoes and garden basil are best. 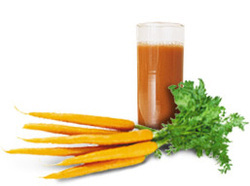 Carrots have carotene which is a natural protection against sunburns. Celery is rich in vitamin C. Garlic defeats high blood pressure and cholesterol, to name but a few of its many benefits. Basil is rich in calcium and iron and has a delicious flavor.